Whether you're embarrassed by unwanted facial hair or are just tired of shaving and waxing, permanent laser hair removal is the solution. Our Certified Laser Technician, Kathy Canada, removes your unwanted hair in a series of safe, effective treatment sessions. Contact our office to schedule your appointment. Laser hair removal works by destroying a hair in its earliest stage of growth. 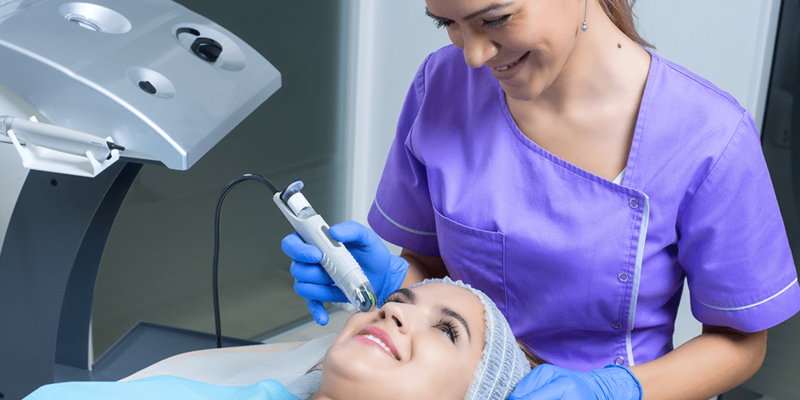 Dr. Warren adjusts the settings on the laser so it’s directed to the pigment in your hair shaft. When subjected to heat, the hair shaft evaporates and damages the follicle that created it. The hair falls out and the damaged follicle can no longer create a new hair. Each of your hairs grows at a different rate. That’s why you need a series of laser hair-removal treatments: Dr. Warren must catch each hair in its early growth stage to minimize the chances of it growing back. Can dermatologists remove my unwanted hair if I have dark skin? Dr. Warren uses an advanced laser hair-removal system that allows her to precisely calibrate the energy to target only the pigment in your hair, no matter how dark your skin is. She can remove your hair without causing side effects, such as hypopigmentation, that can occur with less advanced lasers. How long does it take to remove my unwanted hair? Most men and women need at least six laser hair-removal sessions. Dr. Warren must target each of your hairs when it’s in an early growth phase. Will my unwanted hair grow back? Some follicles may not be completely destroyed during your hair-removal sessions. Therefore, Dr. Warren recommends you have touch-up laser sessions every 6-12 months to keep your skin hair-free. What if I’m losing hair on my head? If you’re losing scalp hairs you very much wish to keep, Dr. Warren can help you too. Dr. Warren offers innovative, minimally-invasive therapies like microneedling and platelet-rich plasma to repair damaged follicles and regrow your hair naturally. You can also talk to her about hair transplant surgery. Contact Dr. Warren at The Dermatology Institute of Georgia. You can call her friendly bilingual staff or use the online booking form.